Peel and cut the mango and peach into chunks. Add them to a food processor or high-speed blender and process until very smooth. Pour the mass from the ice cream machine into a freezer-friendly container and cover with wax paper. Freeze for at least 3-5 hours or you will get the best results if it is left overnight. 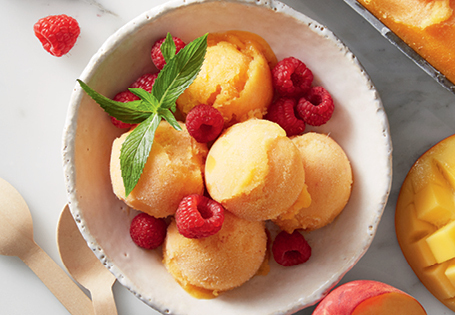 Enjoy your sorbet as is or with fresh fruits.